Dining around a communal hot pot requires the closest of friends. 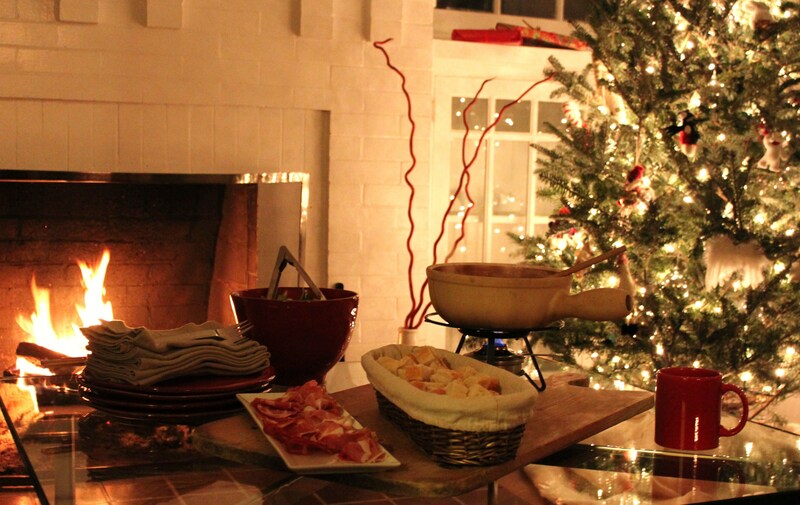 I borrowed my mother’s fondue pot for that very reason – to only invite a small intimate group over for a quiet evening around the fire. After much contemplation over what items to dip into dense and pungent pot of hot cheese I stuck with the standard french bread. You could add anything from apple to broccoli, walnuts, asparagus or potatoes. I’ve had fondue with much more alcohol (including kirsh, etc) but I prefer to keep it simple and not overpower the cheese. This came together in less than 10 minutes and lasted for a brief hour as we reached in time after time soaking up every last bite of the cheese mixture. Cut the garlic clove in half and rub its oils all over the inside of the fondue pot. Place fondue pot directly on top of the gas burner. Bring the wine to a simmer and gradually add the shredded cheese. Once it is melted, add the mixture of additional wine and corn starch to the pot. Transfer to the fondue pot burner. That fondue pot is about 32 years old. Was a wedding present from the Wilburs, good friends of your Grandmother’s. Glad it got put to use one more time. Great looking fire. You should get more wood when you are here.